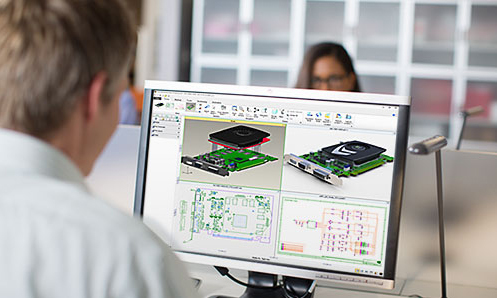 PTC Creo is a suite of applications you can use to design products the way you want – not the way your CAD tool requires. With PTC Creo, you can create, analyze, view, and share designs downstream using 2D CAD, 3D CAD, parametric and direct modeling capabilities. Each PTC Creo application shares the same user interface and is interoperable, meaning data can seamlessly transition from one to another. • Take advantage of technical surfacing capabilities, advanced surfacing, rendering, and reverse engineering. • Explore innovative product development opportunities with the most powerful concept design tools on the market, including: freeform surfacing, integrated parametric and direct modeling, and more. • Easily create 2D schematic designs and documentation for piping, cabling, and harnesses, and then use them to drive the associated 3D CAD models. • It's all here: from the basics of part and assembly modeling to mechanisms to aesthetic surface design. • Analyze and validate the performance of your 3D CAD designs before you make the first part. • Make sure stakeholders throughout the organization can easily view, interact, and share product data. • Ensure product designs seamlessly transition to manufacturing with NC, tooling and mold design solutions. • Work effectively with data from multiple CAD systems in a single design environment.